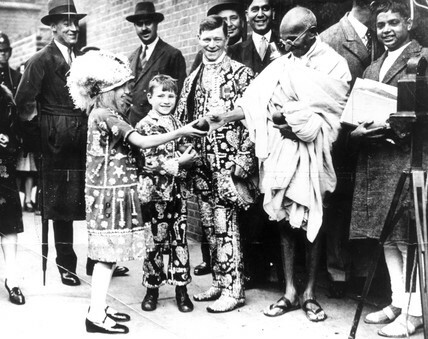 Mahatma Gandhi taking an apple from the daughter of a pearly king. Gandhi (1869-1948) is remembered for his civil disobedience policy against British rule in India and his belief in non-violent protest. Gandhi was involved in negotiations with the British over Indian independence. In 1931, he came to London to attend the Round Table conference on Indian constitutional reform and in 1946 he was involved in the new constitutional structure for independent India. He was assassinated in September 1948.